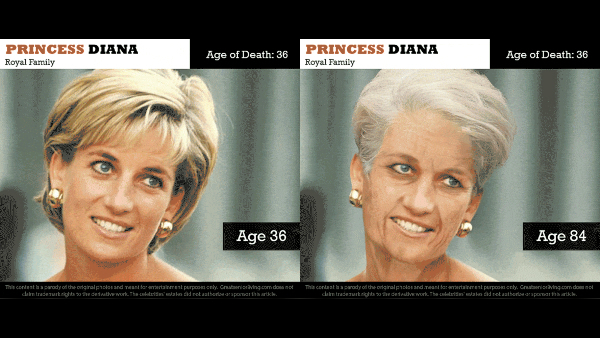 Internationally-renowned icons Princess Diana, Selena, Heath Ledger, Michael Jackson, Amelia Earhart and more have all been immortalized at ages too young to match their legacies. What if they had all lived to see 2019 and beyond? Titled ‘Gone But Not Forgotten’, this intriguing Photoshop series put together by retirement welfare website Great Senior Living depicts the deceased celebrities in the years following their passings. The images, presented as GIFs, see the larger-than-life stars morphing into their golden ages. View the project below and read Great Senior Living’s full blog post, which also imagines what these people might be able to achieve had they surpassed their ages.